It's very difficult to write about science without input from experts. For that reason, I'd like to acknowledge Dr. Walter Bowyer, a professor of chemsitry at Hobart and William Smith Colleges, who kindly agreed to speak with me about the chemistry of candy experiments for an article that had no guarantee of acceptance. The initial interview lasted over an hour, with him patiently explaining sour taste, the chemistry of acid-base reactions, and the mechanics of color separation in chromatography, and he has since been a faithful email correspondent answering some very odd questions. Dr. Frost Steele of BYU's nutrition department was also very helpful in answering my questions about nutrition and oil in candy. 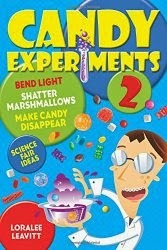 Their information appeared in the article "Candy Secrets," which was published in the October issue of Highlights.